On August 11, our friend, our compa�ero, Bobby Bowens died of cancer. Bobby, a former Captain in the Black Panther Party, a community worker who pioneered needle exchange to fight AIDS, and an active member on the RPA Steering Committee touched many lives. Here we have Bobby's statement of support for the Fit for Life campaign followed by remembrances of Bobby from some RPA Steering Committee members. One of the first efforts of the Black Panther Party was the Free Breakfast for School Children Program, initiated at St. Augustine's Church in Oakland in 1969. We would cook and serve good food. The program became so popular that by the end of the year, the Panthers set up kitchens in cities across the nation, feeding over 10,000 children every day before they went to school. The Richmond branch of the Black Panther Party set up a breakfast program at Shields Reed community center in North Richmond We knew the importance of healthy eating and early childhood development as it relates to productive class room learning and sports. The FIT for LIFE efforts of Dr. Ritterman and the community need to be supported . They will help get good food and good sports to our kids. I had the pleasure of meeting Bobby for the first time during my 2008 Campaign. I remember running across him canvassing in the Coronado neighborhood. He was so warm and authentic. That was my first impression as he stopped his car, rolled down the window and said "Hello Jovanka". I said hello and asked what he was doing. He said he was helping pass out my campaign fliers. I was so honored! Since then I came to know him better through our interactions at RPA meetings and seeing him busy around the community. Another very memorable moment for me with Bobby was during the Occupy protest on November 5th, 2011. I was so excited about being a part of the Occupy movement and seeing the people rise up against oppression. I ran into him standing, appearing to be taking it all in. I told him I'd been waiting for what I was seeing as a revolution, all my life. And it was happening. He smiled with his usual cool, unshaken self, and said, "yeah." We spoke about how we could resurrect the BPP or at least form a group with Panther values of teaching and taking care of our community. Those of us in the Black community have an obligation to our elders such as Bobby and our ancestors, to remember and carry on their legacy. Thank you, Bobby, for being such a positive role-model, living by example, and showing us the true meaning of what it means to have a commitment to community. I met Bobby in the 90's when he started the Needle Exchange Program in Richmond and other parts of Contra Costa County. He was a practical man who in the best spirit of Public Health started implementing a valid solution even if it was not fully accepted by the political establishment. Something needed to be done to prevent further transmission of HIV among injection drug users and Bobby got on doing it. He probably saved hundreds of lives by removing HIV infected needles from circulation. Bobby's demeanor was always welcoming and embracing and his work in public health and youth education persistent and undeterred, always a smile for everyone and a concern for those suffering the most. Bobby participated in many Richmond Progressive Alliance's (RPA) campaigns since 2003 and spread the word and knocked on doors to bring our progressive message for a Better Richmond. He joined the RPA Steering Committee in 2011. About a year ago he marched with the RPA from Richmond to Oakland in support of the Occupy Wall Street movement in Oakland and to shut down the Port of Oakland. He was really happy and hopeful about the Occupy Movement. In Richmond he also joined recently the FIT for LIFE campaign to discourage kids from consuming too much sugary drinks and to create opportunities for sports and physical exercise. On June 8th he wrote to me: "Hi Juan, tomorrow I am going to the hospital. I have a painful spot on my solar plexus and still wheezing in my lungs. My energy level is low. I can't stand or walk for long periods of time without taking frequent breaks. Over exertion seems to aggravate the illness. I will stay in touch. Bobby"
I first met Bobby through activities of the Haiti Action Committee in Oakland, and was pleased to learn that he lived in Richmond. He later joined the RPA Steering Committee and contributed greatly to our discussions about raising community awareness of the oppressive structures that we need to collectively dismantle and replace with a more egalitarian framework. He told me how the Haitian people's ongoing resistance to racial and economic injustices perpetrated against them by the global elites can serve as a model for organizing in Richmond. A time I was able to connect into Bobby busy schedule was to phone him up for a raffle prize he won at the "Native American Health Center-Richmond". We chatted when he stopped in here to pick it up and I began to invite him to other events happening here. Bobby once again said no to me, as he normally did, because he was busy at the same time of the events happening. I had gotten used to it. But this time Bobby took a moment to say to me, "I know it seems like I am blowing you off, but this is what I am doing". Bobby than began telling and explaining to me that his brother had contracted the AIDS virus from a dirty hypodermic needle used for drugs and passed away from the disease. Bobby was now, like clockwork each week, distributing clean hypodermic needles, to the Mission district and other communities in SF; for free, using his own resources, time, energy to take care of strangers who have fallen into addictions and allowed it to overcome their life. Bobby did not want to miss his "regular" distributing time that he started with people who he knew would be looking and waiting for him to show up with clean needles. Bobby felt hope for the fallen people in addictions that most people turn their backs on. I stood there with joy in my heart that I knew someone I would be proud to call my friend. Bobby advocated for decades, and wanted his African American community and communities to learn and know their history so that there would be good change and there would be no more killings or hurting of each other in Richmond. That's my memory of Bobby. I have known Bobby Bowens for nearly 30 years. He came out of the Black Panther school of community organizing and had a socialist revolutionary analysis that enabled us to have very interesting conversations thorough the years. In the early and mid 1980s Richmond had the state's highest HIV-AIDS transmission rate. Bobby was the first African American in Richmond to understand and deal with this by helping to start the needle exchange program, an innovative harm reduction strategy at that time that is now an accepted practice. Bobby was an outspoken critic of the criminal injustice system and was able to understand class division was a real problem and racial division was an artificially created problem. Bobby was always willing to advocate for those who were victimized by social injustice and will be an inspiration for those of us who knew him, to carry the struggle forward. Bobby and I exchanged stories about the Panthers as an organization and the members from the 60s we both knew. He was proud of the Panthers and their work. He wanted to start a program like the Panther Breakfast for Children in Richmond because he understood you had to take care of basic needs for the spirit to thrive. He saw the Fit-for-Life campaign against sugary drinks as an essential part of that perspective. He also knew the importance of vision. In the last year he became very interested in developing new leadership in Richmond's African-American Community. He promoted Martin Luther King's last book, Where Do We Go from Here: Chaos or Community? as an important source of wisdom and direction and started organizing a study group around it. Written shortly before King was killed, the book reflected King's understanding that the struggle for legal equality was not enough. King was struggling to combine the insights of "black power" with the need to challenge an economic system that created general misery and wars of oppression. King sought to bridge the civil rights movement, the anti-war movement, the poor people's movement and the labor movement. He was shot while supporting a public employees strike and preparing for a poor people's march on Washington. The video clip shows Bobby reading an excerpt from the book. We are building new schools for Richmond kids, but even more important is to build healthy bodies and minds. Sodas and other sugary drinks undermine this effort, and the Richmond sugary drinks tax will help our children. Our students do worse and worse every year in the fitness tests, and I worry about them. 52% of our Richmond children are obese or overweight. The problem has hit African American and Latino kids very hard, putting their health at serious risk. Kids need our collective efforts as parents and educators to become healthier and stronger. There are no sugary drinks sold at our schools and we are working hard to expand PE opportunities. But this is not enough. Parents, neighborhoods, and merchants must help to create an after-school environment that promotes healthy diets, physical exercise, sports, and recreation-relaxation. Many of our kids are stressed and use sodas and candy as a way to deal with the stress. For 14 years I have lived with adult-onset diabetes. Looking back, I wish I had known more about diabetes and its causes earlier in my life. Fortunately, I have changed my diet, dropped all sugary drinks, and swim three times a week. I feel great and have no need for diabetes medications. I have complete trust that the Richmond City Council will honor the will of voters and use every cent of the funds raised for the health of Richmond youth. This City Council has demonstrated how much they care for Richmond kids by allocating city funds to prevent the closure of Kennedy High and two local elementary schools. These City Council members have a proven commitment to our children, above and beyond their official responsibilities. They will deliver. Charles Ramsey is a local family law and housing attorney. 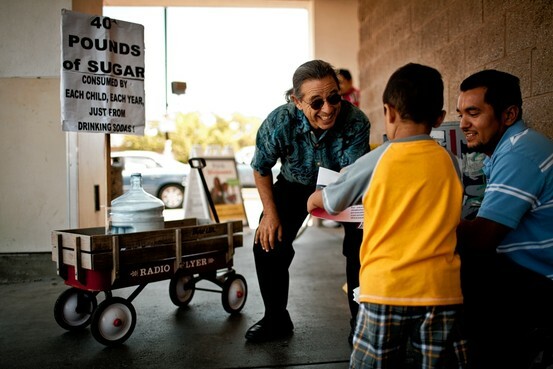 He was first elected to the West Contra Costa Unified School Board in 1993 and re-elected in 1997 and 2002, 2006, and 2010. He currently serves as President of the Board. City Councilman Jeff Ritterman is shown campaigning for a one-cent-per-ounce soda tax early this month in Richmond, Calif. Beverage makers and merchants oppose the tax, which will be on the November ballot. RICHMOND, Calif. This working-class city northeast of San Francisco has emerged as the next battleground between business and health advocates over a municipal tax on sugar-sweetened drinks. In May, Richmond's City Council agreed to put a measure on the November ballot to charge businesses a penny for every ounce of those beverages they sell in the city. If it passes, it would be the first city tax of its kind in the nation and the first to be approved by voters. Communities for a Better Environment (CBE), RPA, and others are organizing a real community meeting to discuss problems and priorities on Thursday August 23. Exact place and time to be announced. View the City's website for contact phone numbers and additional information including the County Health Department's Frequently Asked Questions (FAQ) and links to available air sample analyses. Communities to a Better Environment (CBE) accepted a local government invitation to join in the root cause analysis of the Chevron Fire under the Industrial Safety Ordinance adopted by Contra Costa County and the City of Richmond. In response for demands for a truly independent investigation, County staff proposed a role for community groups already advising the City's refinery project committee. As outlined, the groups would be provided with all factual information an independent investigator hired by the City and paid for by Chevron. The RPA also agreed to participate. For area residents who put up with daily pollution from the refinery and the anxiety and health effects resulting from Monday's fire, the statement added insult to injury. Coming from an agency that is supposed to protect the public, it was particularly disturbing. Following a night of television coverage of thick black smoke spewing from the refinery, it also defied common sense. Chevron will reimburse community members for out-of-pocket medical and property- damage expenses related to the fire. This means community members will be reimbursed for money they pay to receive required medical treatment, including physician and hospitals bills, as well as to repair or replace damaged property. Medical reimbursement would cover, for example, examination or treatment for nose, throat or eye irritation; smoke inhalation or exposure; and asthma-like symptoms, including pulmonary function tests. To file an initial claim, residents do not need to bring documentation of medical services received or property-damage expenses incurred due to the fire, though they will need to provide this paperwork later for reimbursement. A claims deadline has not been set, but initial medical treatment must occur by Aug. 22, 2012. We understand that individuals may be calling members of the community about making claims. These are not Chevron representatives. There are only two ways to file a claim: by calling 866-260-7881 or by visiting the Help Center on Nevin Avenue. Nevin Community Center, 598 Nevin Ave.
One day until the Heal Richmond Town Hall Meeting! Almost 4,500 people have sought medical care since the Chevron Refinery Fire! It's time to improve Health Care in Richmond by Emphasizing Prevention, Access & Quality Care! Join us for an important town hall meeting as we work together to improve health outcomes in our community! We have invited representatives from Lifelong Brookside Community Clinics, Contra Costa County Health Department, and our Richmond City Council members and candidates to share our research and recommendations to improve Health Care in Preventative Care, Access, and Quality Care. This event is Co-Sponsored by East Bay Center for Performing Arts. Zolina Zizi, a supporter of the Fit for Life campaign and Iron Triangle resident, has been selected to represent Richmond in the Pathstar program (http://www.pathstar.org/ ) for 2012, which includes intensive training and a swim from Alcatraz as well as speaking appearances at conferences across the country about diabetes prevention. She needs to raise $5,000 in sponsorship funds before October, and has a commitment of matching funds, so please add your dollars if you can. See her letter below, and contact her directly for more information. My immediate family all have diabetes and luckily I don't. I feel it, in a way, skipped me because of my healthy eating and active lifestyle. From watching the film and doing some research on my own it is a big problem within the Native American community. Anything I can do to bring awareness to the Native American community not only in the Bay Area but all over would be the greatest accomplishment any one can have. This year's swim is on October 8th. The total cost of the swim is $5000. It cost this much for housing, food, transportation, and events throughout the year. The commitment to the swim isn't only throughout the week, but throughout that whole year and the rest of your life. The diabetes conventions are mainly why the cost is so high. It covers the transportation and hotel costs so the swimmers can attend and speak at each event all over the states and even Ireland . I'm hoping you will be able to help me with some of the cost. I already have a commitment from a donor in the community who will match every donation I receive up to $2,500, to make up the full amount of $5,000 that I need to raise, so every dollar you give will be doubled. de 5:30 a 6:30 p.m.